A great side dish that compliments almost any meal! Combine sour cream, cream of chicken soup, onion, cheese, salt and pepper in a large bowl. Stir in hash brown potatoes. Pour and evenly spread into a greased 9x13. In a medium bowl, melt butter and stir in crushed cornflakes. Evenly top casserole with buttered corn flakes. Bake at 350 degrees F for 30-45 minutes. Love this! And I haven't gotten to tell you that I am really enjoying your new design. :) So pretty! Yum, my favorite too! These are the best and freeze really well to make ahead of time. Your pictures are amazing! Droooooooling. This looks so cheesy and delicious! I just want to dive into all that crunchy, creamy, cheesy yumminess. I make something pretty similar to this...it's requested at every family gathering! So YUMMY!!! I make almost this same exact recipe except use green onions and garlic instead of onion. We call them "heart attack potatoes". So yummy! Have you ever tried making these in the crock pot? If so, did it work ok? 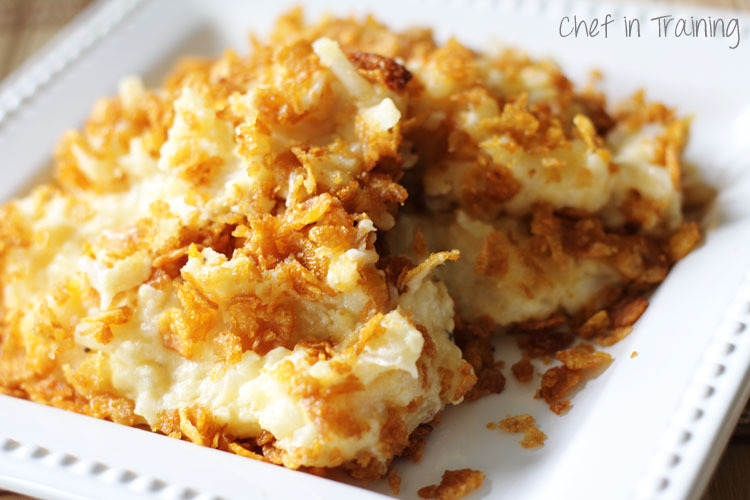 You could probably do the potato part in the crock pot, but you really need the oven to get the corn flake topping crunchy. It would just get soggy in the crock pot. I'm so glad I found this recipe on Pinterest! I will be making this for my family's Christmas get together!! Would it be ok to use this on our blog and link back to you with credit? Thanks! Do you use 2 cups of crushed corn flakes or 2 cups of corn flakes that are then crushed? Two cups of crushed corn flakes. Crush them first, then measure. Great question! Let me know if you run into any more, I'm happy to help! Looks sooo delish!! Any ideas for a substitute if we don't want to use the cream of chicken soup? Could I just use cream instead and maybe a bit of flour to make it thicker?? Thanks so much can't wait to make these I grew up on this and loveeeee them but no longer eat meat and would prefer to leave out the soup.....if it's possible!! Thanks!!!!!! Do you need to thaw the frozen potatoes first? So this recepie has been in my family for over 30 years, but with one alteration with I highly suggest...use Ritz crackers instead of cornflakes...it really adds that extra wow! Yes that is what my grandmother always uses . Great on top of Mac&cheese also. Some one said to usr cheese nips orchestra crackers. Wouldn't they make is dish to salty. I have always used the canned French Fried Onion rings for topping. Add them when the potatoes are done or they'll burn. Already crispy. Are the frozen hash browns the shredded type? Don't use the shredded hash browns. Look for the ore-ida Southern Style hash Browns - or any little squares. I like to use Longhorn Cheddar or Colby Cheese. Only getting part of the recipe, cut off top to bottom. Would really like to try this recipe. Can this be fixed? Wow, I haven't thought of these forever! We called them fabulous potatoes when I was growing up - and they sure are! Thanks for reminding me of them. Gonna have to whip some up this weekend! This is a family favorite around our table! It will certainly be there this Thursday! I'm glad to find a spot I can refer to this excellent dish if I'm in need of it! Thank you for sharing the delicious love! MmmmMmmm Yummy! Can you use any substitute for the sour cream? Really don't care for corn flake topping. Is there something else I could substitute for that? Love the recipe! My sister uses crushed Ritz crackers. This is a delicious recipe! I made it for brunch, 2 pans of it and there wasn't a spoonful left! The only thing I did different was to sauté up my onion before adding it...just a personal preference! Believe it or not but this recipe was actually on the back of Campbell's soup many years ago. That's when my grandmother started making it. Leave the cheese out of the mixture and top it with the cheese then cornflakes and butter. The cornflakes taste better not crushed and you can just lightly pour the butter on top. Making sure to get around the edges of your casserole dish. You can use tiny diced potatoes or just plain grated potatoes if you have the patience. You'll need to rinse and drain and squeeze the water out of fresh ones. Really squeeze the hell out of them. But they will work if you're willing to put the time in. These sound really yummy… but I'm a vegetarian. What would be a good substitute for cream of chicken? Would cream of mushroom work as well? You can use it, the mushroom soup changes the flavor slightly (made it once by mistake), but not in a bad way. Just a different flavor than I was used to. We always use Wavy Lays Potato Chips crumbled on top. Deeelicious!!!! Our family preference is for the Southern style hash browns (diced potatoes) instead of the shredded. We find that using shredded potatoes makes the casserole a bit too mushy (but thankfully there are both kinds to suit everybody's preference). We also use reduced sodium cream of chicken soup (plenty of salt in the chips). I use the southern style hash browns (diced potatoes) and also add browned pork sausage (Bob Evans or Jimmy Dean, etc.). The sausage adds a wonderful flavor addition to a very tasty casserole. Try it!!! Do you thaw the hash browns first or use frozen? Thx! I remember the first tme l fixed this my daughter was having the family reunion so her and l started to make it together l turned around she was long gone l got everything together went looking for her l say l really feel as though we need to put something else in this she said you know l picked up a large pack of of that diced ham you like that you always put in your green beans so l put a good 1-1/2 cups of diced ham into the casserole at it was just one cup then l ended up with more.I didn`t want to over power it with to much ham for you see we are making a double batch. I must say it was Delish !!! What I also did I made one casserole with the Crushed Corn Flakes the other one I crushed up 2 packs of Town House Crackers (I find that Riz Crackers are more Salted). With in 30 minutes both casseroles vanished just by luck after the 1st round l went over and fixed My Husband, Daughter, MySelf a platter !!! We have always serve our guest first !!! Thank you so very much for the Recipe My Daughter never did make me a copy now I have it I will tease her about it !!! We call it Funeral Potatoes. Can use fresh cooked potatoes, hush puppies (yes) and even drained canned potatoes. Makes a lot and is a crowd pleaser. I make this & improvise a bit to make it more healthy. Instead of a canned soup, I do a blend of vegetable stock, whole grain flour, milk, lemon & chive dressing for flavor, cream cheese. I put in a pot to heat up and mix together with butter to create a creamy soup. I threw in some frozen vegtables, just a little. Instead of using corn flakes I use blue corn tortilla chips. I don't use can foods because studies show the preservatives lining the can cause cancer. I eat organic so I like to try to keep things as natural as possible. I also dice my own potatoes up red skins and keep the skin on. Cheaper than buying frozen hash browns. These are an absolute fave in our family! I make them for just about every family get together and even superbowl parties. Only thing I change is frosted flakes instead of corn flakes, it gives it a little sweetness to it!! Not even a crumb is left over in the pan every time!! What kind of cheese do you recommend? It calls for 2 cups shredded cheese but doesn't mention the type of cheese. We call these "Sinful Potatoes". Next time you make them, cook the onion in about 2/3 cube of butter until soft, then combine them with the soup and sour cream mixture. Increase the sour cream by 1/2 cup. We use tater tots instead of hash browns. Anyway, try it this way and see if you like it better. I prefer a recipe to specify how much salt to use instead of "to taste"
This sounds so yummy! I would have never thought that corn flakes were what's on top. Iam about to ask a really dumb question...but are you using non frosted flakes? Why does everything START with prepared or frozen food? What about a FRESH POTATO? Can you substitute onion powder or minced onion for the whole onion? My husband doesn't like onions but I don't want to lose the taste. This is very good it is just my hubby and I so what I did was I cut it in half or l make the whole recipe and give over half to our daughter and her family. They love it l do add a few extra ingredents. Thank you for your recipe !!! Awful. Watery, potatoes not done. Baked for over an hour. Followed the recipe completely. Not my first rodeo. A nice way to throw out $8. Back to training. Very disappointed! I make this, and love it, but I use cheddar soup(condensed) and cornflake crumbs from a box. Yummy. 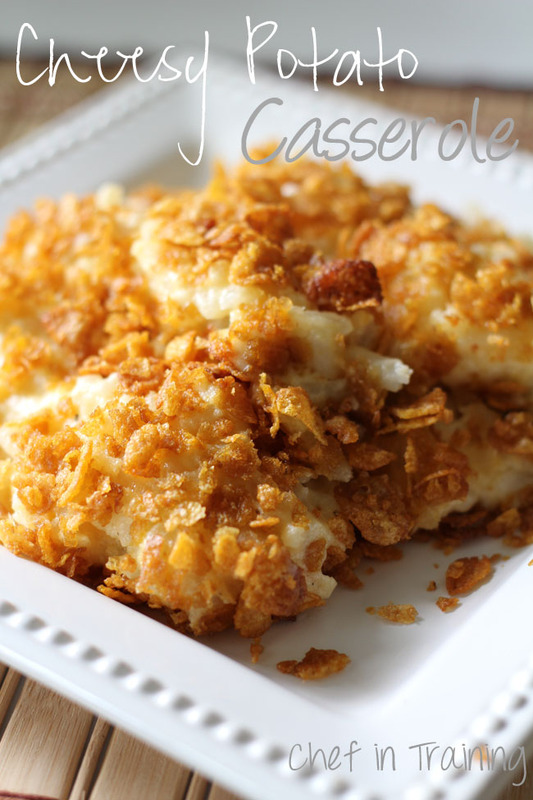 I'd substitute French's fried onion for the corn flakes, but the rest sounds great! Please change the post on Pinterest as it is labeled gluten free. This recipe is not gluten free. Hi Leigh. I don't label them myself. Pinterest does that unfortunately. This is definitely not gluten free :( Sorry about that! I've made this for Christmas for years, it's my "thing" here, but it's hashbrown casserole in my recipe box :-). I use 1 can cream of chicken and 1 can of cream of mushroom. I also use frosted flakes to give it a sweet kick, though like it the other way. Don't knock the flakes before you try them! Retirement party at his work. Very well received and none left! I'm so grateful to have found this, through your pinterest. I will be making this again! Try using crushed up Cheez-Its for the topping! So much tastier than corn flakes...and you don't have to mix them with melted butter before you put them on top! Soup?.....in a can?.....yuck....this is not chef style! how many would you say this casserole feeds? Instead of the corn flake crumbs I top this with a can of the french fried onion rings. Yummmmm ! Everyone one in the family asks for me to make them each time we get together. I made this for my family yesterday, with a few tweaks, and my family loved it! I added some finely chopped celery (about 3 Tblspn), a 12 oz. pkg of bacon, cut small & cooked crisp, and I substituted 1/2 of the butter with bacon drippings. So good and reheats well in the microwave. With many variations of this online we like using French fried onions on top. So good! It's cheesy crunch can't be beat. We have a similar recipe that has been in our family for 25 yrs. We call it "Yummy Potatoes" and we use cream of mushroom soup instead of cream of chicken. It is a holiday favorite, as well as, potluck favorite. I will try it with the other soup soon. I sauté the diced onions in the butter until softened, then combine it with all the other ingredients. When you bake this, should the bottom get brown??? Mine never did! Im thinking of adding jalapeños!! Any thoughts? This old recipe has been modified to the convenience of today's fast pace. Originally it was 9 medium potatoes cooked in their skins and refrigerated over night. Peel the skins and grate the cold potatoes. Shred 2 cups (16oz) of cheddar cheese, instead of buying already shredded. Use green onions..makes it nicer looking too. Also use softened, not melted, butter to your crushed corn flakes, they are so much easier to use in my opinion. If you look at the ingredients in packaged potatoes and shredded cheese there's additives in them so I do it the old fashion way and I have to admit you can taste the difference! I've been making them for almost 40 years now and always a family fav! Hope this helps for those that don't mind the extra work but less addictives and preservatives is a plus and well worth it..enjoy!! what kind of shredded cheese? Can we use regular non frozen potatoes for this? Just cut them up super small or grate them? Or would that not work . Want to give this a try and I hAve a huge bag of potatoes I want to use. 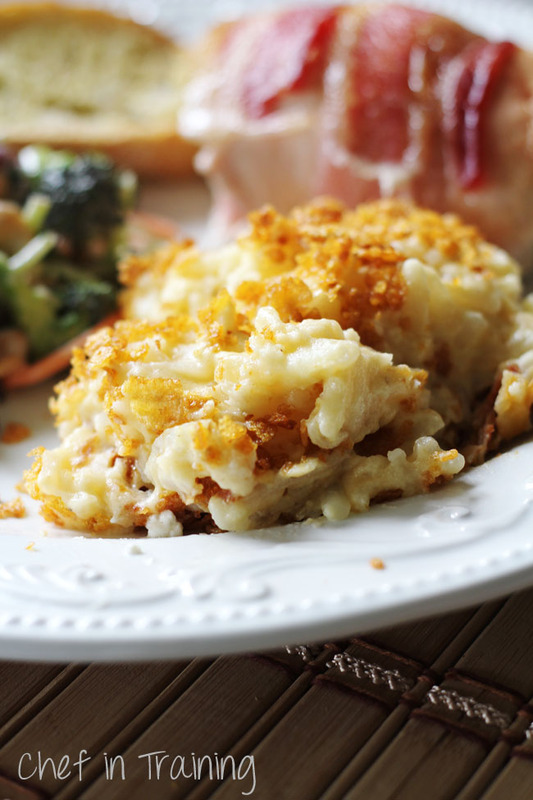 My family has always called this hashbrown bake. One suggestion is to cook the onions before putting it in together. Some people don't like the taste of slightly raw onions, and I've had a few turn out like that. Fresh potatoes are delicious, too, if you don't have frozen. This recipe is awesome! Only thing I do differently is use Ritz crackers crushed up instead of corn flakes..Tastes so decadent! Ive been making this recipe for over a year and I always get a ton of compliments on it.. I'm making it for Easter dinner in a couple days.. Thanks for the recipe! Can u make this a day ahead and cook next day? Super good! I added a packet of onion soup to my sources cream! Looks delicious! We have company coming over tonight and I'm planning to make this as a side dish for steak. This recipe looks great! I've wanted to make this ever since my best friend's mother made them for her birthday. I'm actually planning on making them on Saturday. However, I have one question. I read in the comments that you used shredded hash brown potatoes; is it possible to use diced hash brown potatoes instead? Looks great! Can you substitute the sour cream with anything? I have a few that can't take the sour cream? I just made this. I used shredded hash browns. I didn't crush the corn flakes. I baked the hash browns for 20 mins first then added my corn flakes and let baked the rest of the way. Very good! Will make it again! I love this recipe! Do you have any suggestions as to how to transport it when taking it to a pot luck? I’m concerned that if I cover it the corn flakes will lose their crunch and get mushy.